Want to know where you can buy $100 iTunes gift cards for $85? Did you know you can pay your taxes by using a cash-back credit card? Why are you still paying $235 a year to rent your cable box? You're leaving money on the table every day, with every transaction you make: changing your oil, withdrawing ATM cash, booking flights, buying insurance, shopping for clothes, squirting toothpaste. 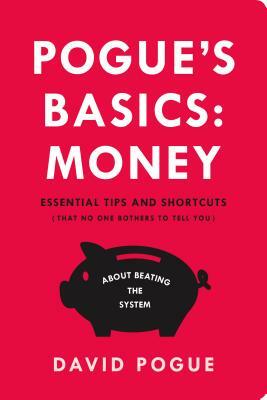 But in Pogue's Basics: Money, the third book of this New York Times bestselling series, David Pogue proves that information is money. Each of his 150 simple tips and tricks includes a ballpark estimate of the money you could make or save. Okay, you won't use every tip in the book—but if you did, you'd come ahead by $61,195 a year. DAVID POGUE has 1.5 million followers on Twitter and recently launched a consumer-tech site for Yahoo. Previously he was the tech columnist at The New York Times for thirteen years where he wrote weekly columns that constantly ended up on the Top Ten List of most e-mailed articles of the paper. Additionally Pogue writes a monthly column for Scientific American, is the creator of the Missing Manual computer-book series, and hosts science shows on PBS's NOVA. He has been a correspondent for CBS Sunday Morning since 2002, for which he has won two Emmys, as well as two Webbys, and a Loeb award for journalism.